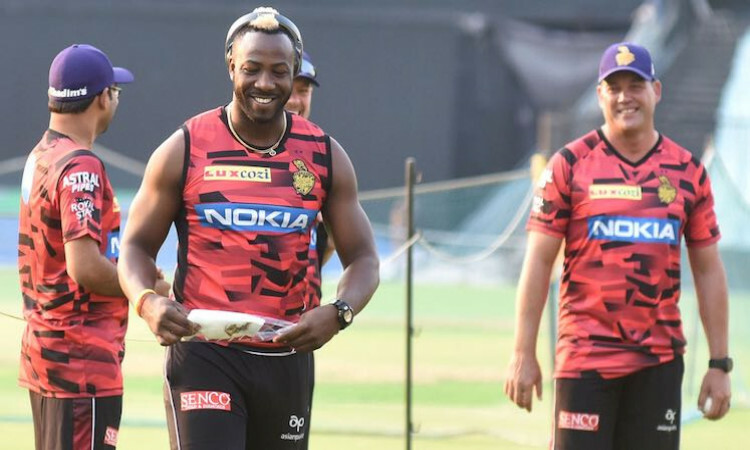 Kolkata, March 25 - Iconic all-rounder and Kolkata Knight Riders (KKR) head coach Jacques Kallis on Monday said that Andre Russell was one of the most powerful hitters he has seen. KKR rode on Russell's whirlwind unbeaten 19-ball 49 to chase down a 182-run target to beat Sunrisers Hyderabad (SRH) in a thrilling Indian Premier League (IPL) match at the Eden Gardens on Sunday. Russell walked in to bat when KKR had just lost the set Nitish Rana (68) and still needed 68 off 27 balls. The big-hitting Caribbean all-rounder first hit Siddharth Kaul for 19 runs in the 18th over and smashed 21 more off death-over specialist Bhuvneshwar Kumar in the 19th to steer KKR home with two balls to spare. "In terms of finishing, he is one of the most powerful hitters that I have seen," Kallis told reporters at the Jadavpur University second campus ground. AKKR had an optional training session on Monday which was attended by those who did not feature in Sunday's game. A"It was a good knock. He timed it well. And there were issues, the light wasn't incredible. But it was some of the best ball striking I have seen in a long time," said the former South Africa all-rounder. KKR will next take on Kings XI Punjab on Wednesday, a team that boasts of Chris Gayle. Asked to compare Russell with Gayle, Kallis said: "He is certainly up there. It's a very different role when you are batting down the order at No. 6, 7 or 8 as compared to to facing the new ball. So it's difficult to compare new ball batters with old ball batsmen." On Sunday, Sunil Narine picked up an injury on the field and could not open the batting, prompting Nitish Rana to come up the order. And the left-hander did full justice to the decision by setting the tone for KKR's chase with a chanceless 47-ball 68. On Narine's injury, Kallis said that it was a soft one and he should be fine before the next game. A"I don't think the injury is too bad. I think he will come through. It's just a soft tissue and he is a hard guy, I am sure he will be fine," he said. Kallis said sending Rana to open the innings was a tactical decision prompted fully by Narine's injury, adding that more such moves were in store to keep the opponents guessing. "Narine hurt his finger in the field. Plus, there are a few tactical things which we will keep changing throughout the season so that we don't become predictable. Going forward, we will do a few things which are slightly different so that we can keep the opposition guessing. We got some ideas up our sleeves for the rest of the season," the 43-year-old said. "We will change as the season goes. That's how it works in T20 cricket," he said. Kallis also said that the KKR dressing room always believed that they can chase the total down on Sunday, even when the equation was 53 to get from 18 deliveries. "I have seen him (Russell) go about his business. So as long as he was in there, hitting as well as he was, we were always in with a chance. It needed to be a special knock and it was," Kallis said. He also praised Shubman Gill who hit two sixes in the last over off Shakib Al Hasan to seal KKR's victory. "I'm happy with the way Gilly (Shubman Gill) played too. He showed a lot of maturity," he said. Kallis also didn't not believe that KKR bowled badly, reiterating that the franchise had one of the best bowling arsenals in the competition. "We bowled pretty well. We could have improved on one-two things but we bowled to a plan and 180 was a par score on that wicket. I am confident about our bowling attack. Our spin department is one the best in the tournament. I think the guys will take a lot of confidence from the win yesterday," Kallis said. On New Zealand pacer Lockie Ferguson who played his first IPL game on Sunday, Kallis said: "It was a great start for us. He bowled at a tough time up front and at the death which isn't easy, especially at the Eden Gardens. The way he went about his business was good for us." "We conceded 37 runs in the last four overs, which is magnificent. It made life a lot easier for the batters," he concluded.